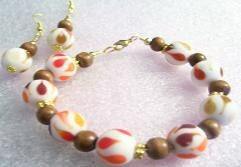 These are unique white beads with warm color swirls of red, orange, brown and gold spacers separated with brown wooden beads. 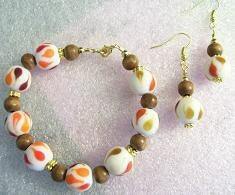 With matching earrings that hang from gold ear hooks. The bracelet made in the same fashion with thicker gold spacers and gold lobster claw clasp. This would make a great addition to your jewelry box or give them as a gift!